BEST QUALITY & PORTABLE DURABLE BUBBLE WAND : Our bubble wand are made of stainless steel, with a telescopic design that can be freely changed in length. It is easy to carry with the sponge made handle, comfortable to use, not a one-time product. 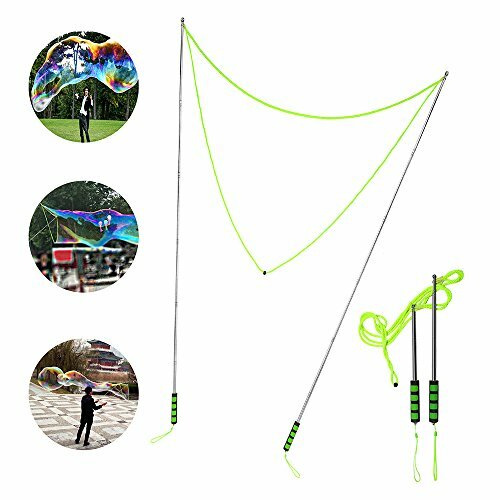 OUTDOOR FAMILY FUN BUBBLE TOYS : A wonderful birthday activity or gift for boys & girls of all ages, parents can let kids play with the giant bubble wands in the backyard, park or beach. Teachers can use it for science class at school. NO-RISK PURCHASE! UNCONDITIONAL 30-DAY MONEY-BACK GUARANTEE. If you\'re unsatisfied with this bubble wand for any reason, we\'ll immediately refund your purchase price.